Whether your facility is a restaurant, a manufacturing complex or an office building, if the heat or air isn't working, we understand that your business can be losing money. We provide fast and reliable service to our commercial and industrial clients. 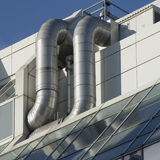 We design HVAC systems to maximize efficiency and minimize operational costs. Our solutions feature precise digital control of equipment to optimize climate control, maximize energy savings, reduce unscheduled maintenance and lengthen equipment lifespan. Please contact us today for a consultation on your HVAC needs.